World Championship G8 – Anand strikes back, wins in 17 moves! 5/21/2012 – What a game, what a fascinating turn of events! 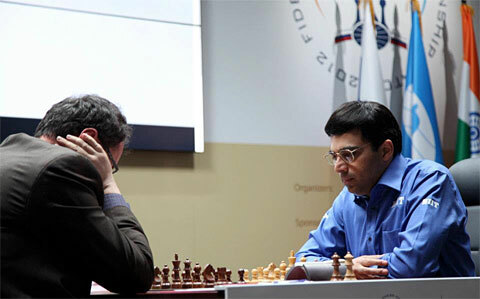 World Champion Vishy Anand shockingly lost the seventh game and let Challenger Boris Gelfand take the lead. Today he struck back with a resounding 17-move win that took commentators Peter Leko and Ian Nepomniachtchi and more importantly Gelfand completely by surprise. Express report with tons of GM commentary and videos. Round eight – Anand strikes back, wins in 17 moves! 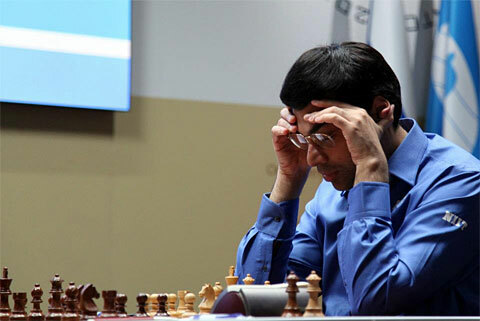 The reigning World Chess Champion Viswanathan Anand bounced back into the World Chess Championship in style with a short, sweet and stunning victory over Challenger Boris Gelfand in the eighth game. Yesterday night in the seventh game, Anand had ended on the losing side but the ‘Chennai Tiger’ as he is known roared back with a 17 move victory. Anand was in full flow today and showed his natural aggressive side. It was a fantastic effort by him as one seldom comes across a decisive miniature less than 20 moves in World Championship games. What is more important is the way Anand shrugged off yesterday’s defeat and would definitely be enjoying a psychological edge and to a certain extent some peaceful sleep and rest on the free day. The theoretical discussion in the Grunfeld did continue, which incidentally has been Gelfand’s pet defence so far in this event. Gelfand deviated rather early on the third move from their third game in this match. Gaining confidence after yesterday’s victory he tried to provoke Anand on the kingside, but the Indian did not take the bait. An invitation to swap bishops on the eighth move by Gelfand was rather surprising. Anand unhesitatingly accepted. 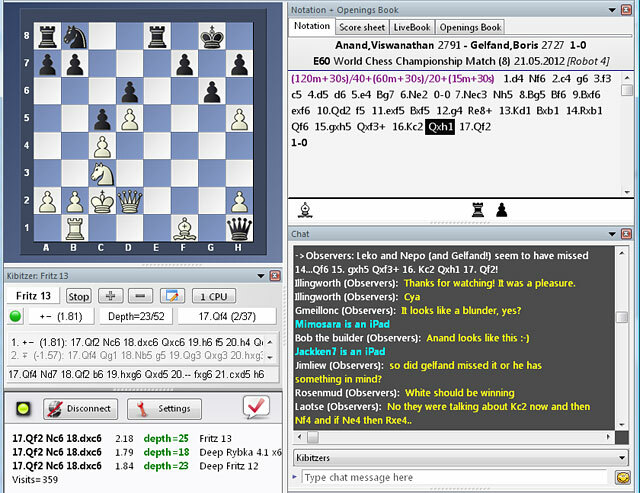 Another sharp move by Gelfand on the tenth move and Anand was equal to the challenge. By the twelfth move Anand appeared distinctly better, and a wrong queen move on the 14th had Anand smelling victory! Gelfand’s queen ventured into Anand’s territory and it was probably too late for the Challenger to realize that there was no way out for her, prompting an immediate resignation. The Score once again stands equal 4-4 in the 12 Game Match. Tuesday is the rest day and the ninth game will be played on Wednesday with Gelfand wielding white. 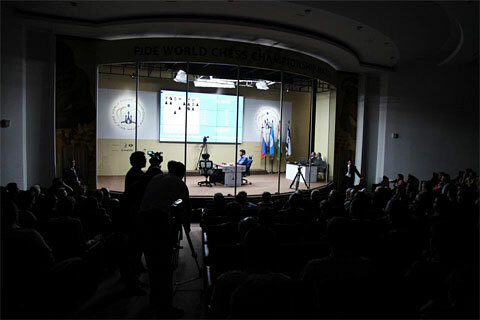 GM Robert Fontaine and his video producer Gérard Demuydt are in Moscow produced video reports and interviews after each round for the French chess magazine Europe Echecs. In this musically enhanced round eight report we see the moment Gelfand realises that 17.Qf2 traps his queen. Interesting to hear Anand and Peter Leko talk about it in the press conference. We would strongly advocate replaying the HD video stream that is provided by the organisers (below) and fast forward to the position after White's 14th move – that's around 16:41:00 into the stream, and especially from 16:48:00 onwards. Very entertaining – do not miss it!